If you’re in the market for a new blender (or your first), you’re probably wondering which ones are the best blenders for vegans. 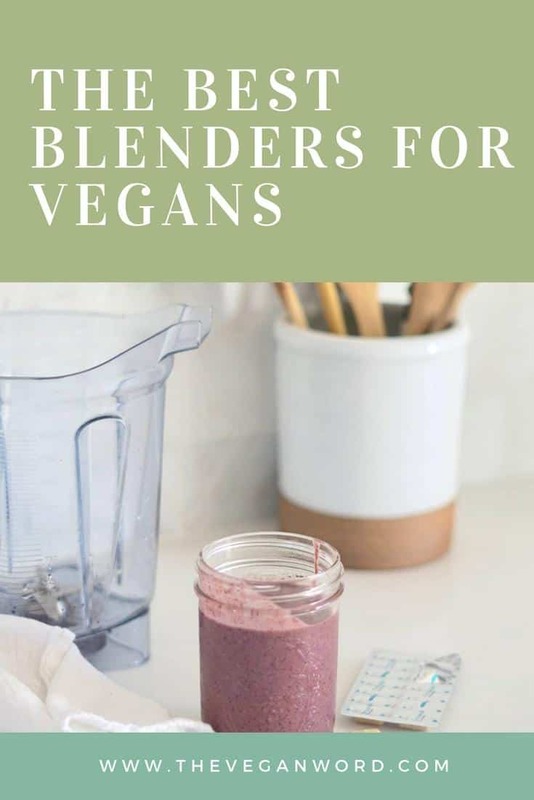 Blenders are probably the most used appliance in vegan kitchens, and with good reason, which is why I’ve put together this guide to buying a blender for you. You might be wondering…Blendtec or Vitamix? Or Ninja? Or Nutribullet? The best blenders for green smoothies? The best blenders for acai bowls? The best blenders for nut butters? With so many factors, how do you choose? Whether you’re looking for the best blenders for smoothies, the best vegan mixer or the best blenders for almond milk, I’ve got you covered. See my quick comparison chart, or more information below. Not only will a good blender allow you to whip up a healthy breakfast like a smoothie, good blenders mean you can make healthy, plant-based meals throughout the day, like a hearty, creamy butternut squash soup for lunch or vegan cheese to top your pasta dinner. 3b. What is the jug made out of — plastic or glass? Since blenders are such a crucial part of a vegan kitchen, I recommend you buy the best blender your money can buy. In the comparison chart, I’ve broken down the best blenders for vegans by watts (which measures how strong it is, and can give you an idea of how efficiently it will blitz nuts into vegan cheese, dairy-free milk and cashew cream), price and jug type (glass or plastic). These are the best blenders Amazon has, so I’ve included an Amazon link for you to buy, too. My rating is based on the balance of these factors. Below you’ll find more in depth information about each blender. Blenders are the most useful appliance to the vegan kitchen, so for that reason I recommend anyone adopting a plant-based diet buy one. I use my blender every day to whip up healthy sauces, soups, smoothies and vegan cheeses. For years, I’d buy the cheapest blender I could find, thinking that way I’d just replace it when the motor inevitably wore out. I just assumed that the motor would die, and since at the time there was no way I could afford a Vitamix like my parents had, that I was doomed to a life of blenders dying every 6 months. One day, I decided I’d had enough, and started researching blenders. I spent countless hours reading up on blenders and saved money for a year so I could buy my first high-powered blender and it was the best thing I’ve ever bought for my kitchen, hands-down. I use my high-speed blender every day. I’ve had it for five years now and it’s going strong, and in that time I’ve actually saved money compared to when I was buying a cheap blender every 6 months to a year. Learn from my mistakes. Buy the best blender you can afford. A food processor, on the other hand, is ideal if you want to make sauces, dips or food that contains less liquid. Click here to read my food processor buying guide. I think both a blender and food processor are essential components of a vegan kitchen. Click here to see my guide to the best kitchen gadget for vegans. It can be hard cutting through all the marketing hype around blenders. That’s why I created this blender buying guide to help you. Watts: this measures the strength of a blender’s motor. This will give you an idea of how powerful the blender is. What is the jug made out of — plastic or glass? What are you planning to make in your blender? This is the trickiest part of comparing blenders, because many companies over-hype just how powerful they claim their blender to be. As this article from a cooking-engineering blog shows (super nerdy, love it! ), there’s a big difference between peak horsepower (often advertised) and rated horsepower. Peak horsepower, which you’ll often seen advertised on blenders, is the maximum power the blender can achieve. While rated horsepower, on the other hand, is what it will usually achieve. So, we’ll be comparing watts, as this is a more standard measure. The recommended watts for a high-speed blender is 1100. This may seem like a simple choice if you’re worried about BPA in plastics. However, many high-speed blenders use plastic jugs because glass jugs can be dangerous if someone accidentally leaves a metal fork or spoon in the jug and then turns it on. Plastic is also lighter weight. However, I have a (tempered) glass blender jug and I love it. It’s very easy to clean and doesn’t retain cooking smells or get discoloured like plastic can. If you get a blender with a glass jug, just be extra careful not to accidentally leave cutlery in it (which you should be careful of anyway!). Looking for the best budget blender for smoothies? If you’re only going to use your blender for smoothies, you can opt for a smaller, personal model, or even a smoothie blender. Looking for the best blender to make almond milk? If you’re going to make vegan cheeses and nut milks in the blender, opt for a high-speed model that will blitz all the nuts until no lumps are left.These make the best blender for making almond milk, cashew cream or anything creamy. If you want to make hot soup in the blender, opt for a pro blender like the Vitamix, which can turn raw veggies into a hot soup. Look for models that are self-cleaning (just add hot water, dish soap and turn on for 60 seconds). Or, if you prefer to use the dishwasher, make sure the parts of the blender are dishwasher-safe. You might also want to look at how easy it is to disassemble the blender’s parts for easier cleaning. If you plan on keeping your blender on the counter, you’ll want to make sure you have enough clearance under your counters to fit the blender. If you have a small kitchen, conversely, make sure you have enough space in the cupboards for your blender and choose a smaller model. First, determine how much you can spend on a blender. I highly recommend buying the best blender you can afford. This is one appliance it’s worth investing in! If you get a high-quality blender, it will be with you for years to come. It will also make it much easier to stick to eating vegan and to make healthy, plant-based meals for yourself and your family. However, I’ve included a range of prices, from the best blenders on a budget to the high end, high powered blenders. What’s the best vegan blender? The Vitamix 7500 is my top pick. Looking for the best blender for vegan cheese? This thing will blitz through nuts living no pieces behind. The best blender for soup? Again, the Vitamix, which is an excellent vegetable blender and can even ‘heat’ up a soup made from raw vegetables in minutes (it purees and heats at the same time, thanks to the motor). Looking for the best blender for nut milk? The best blender for cashew cream? The Vitamix 7500 it the best blender for nuts, giving you the silkiest, smoothest almond milk and creamiest cashew cream. Looking for the best blender for a raw vegan? You’ll need to find the best blender for making smoothies so you can whip up green smoothies in minutes. The Vitamix is the best raw food blender and will make you the creamiest smoothies, nice creams and more. No matter what you want to make in your blender, the Vitamix 7500 is going to make it easy. It’s simply the best blender vegan -wise. There’s a reason Vitamix blenders are so popular with chefs, vegan cookbook authors and raw food eaters. Is this the best Vitamix blender? To be honest, their entire range is excellent, but this one’s my top pick. With plenty of watts (over 1400) the Vitamix 7500 is strong. It’s the best blender for making nice cream, cashew cream, almond milk or just about anything you could throw at it. It also has a dial allowing you to choose from a variety of speeds (important if you’re chopping nuts vs pureeing a soup), and a pulse function, crucial for giving you more control over stopping and starting (again, useful for chopping). And it’s not just for you if you’ve already adopted a plant-based diet — it’s an excellent mixer, vegan or not. It doesn’t have the high-tech touch display of some other pro blenders, so if you want that, opt for a different blender model. Nor does it have pre-programmed settings that allow you to turn it on and walk away; if you want these, go for the slightly higher priced Vitamix 750. Looking for the best blender for almond milk, other plant milks and soups? At over $500, this Vitamix blender isn’t cheap, but if you’re planning on using it frequently (daily or several times a week) then it’s a great pro blender. 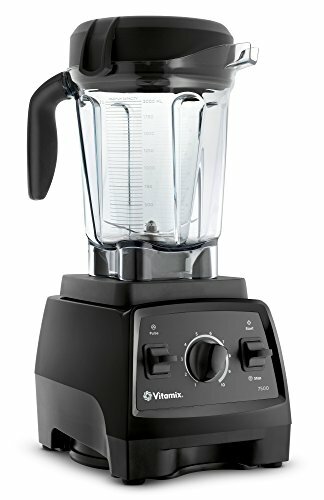 My pick for the best blender of the vegan Vitamix bunch, especially if you want one that can do anything and will last. Whether you’re looking for the best blender for nice cream, the best blender for making nut milk, the best raw food blenders or the best appliance for making smoothies: the Vitamix 7500 is it. My parents have owned their Vitamix (with an original stainless steel jug) since the 90s. The Vitamix 7500 is perfect if you want a top rated blender and aren’t concerned about the price tag. 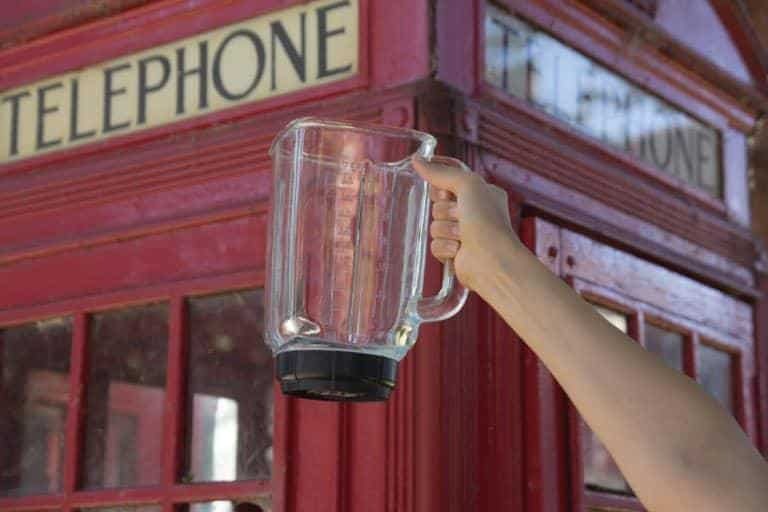 Be sure you buy the right Vitamix for your country’s electrical system; if you’re looking for Vitamix UK for example you’ll need one with a UK plug (don’t make the same mistake a friend made and order one from the US–when she plugged it in, it blew a fuse and destroyed the blender). If you click on the link below I’ve directed it to your local Amazon store! 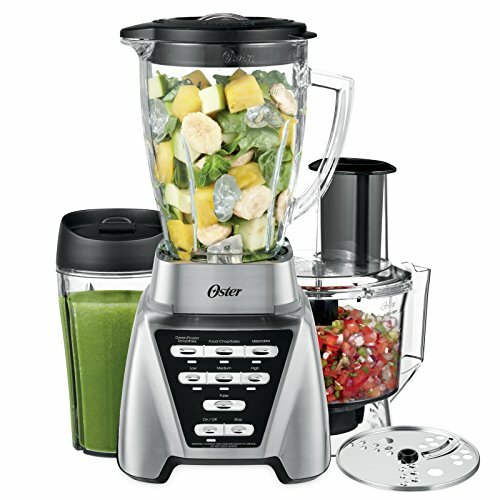 The best choice for a blender with a glass jug and the best blender for vegans on a budget, the Oster 1200 comes with a powerful 1200 watts for under $100. If you’re looking for a good blender for smoothies that won’t break the bank, then the Oster pro 1200 blender is an excellent choice. It also comes with a smoothie cup and food processor. However, as with most combination blender/food processors, the food processor side doesn’t work as well (you’re better off buying a separate, dedicated food processor). At this price, the Oster 1200 is excellent value for money, and is my top pick for a budget blender under $100. WIth 1200 watts of power, the Oster 1200 is a pretty powerful machine, and has 7 speed settings plus pulse (a pulse function is important for giving you more control over chopping). It also has pre-programmed settings for smoothies, milkshakes and more. However, don’t expect it to get smoothies as smooth as a more expensive high-speed blender like the Vitamix. At under $100, the Oster 1200 is my choice for the best cheap blender; it’s certainly the best blender for the money or one of the best. However, the blender does have limitations at this price. It doesn’t puree veggies as efficiently as more expensive blenders, so if you add, say, kale you may find the result slightly gritty. It’s also hard to screw and unscrew its parts, meaning leaking is likely, so you’ll want to make sure you have the parts screwed tightly on every time before use. If you want a blender with a glass jug, and aren’t as concerned about how smooth your blender makes things, then the Oster 1200 is a solid choice at a great price. Just make sure you fully screw all parts together completely to avoid leaking. At under $200, the Ninja Auto-IQ might be the best affordable blender that still has plenty of power. In fact, it has 1500 watts compared with the Vitamix 7500’s (my top pick) 1440. However, don’t jump to the conclusion that it’s a better blender. The Vitamix is made with metal connecting parts, while the Ninja Auto-IQ’s are plastic, meaning over time, it’s more likely to break. 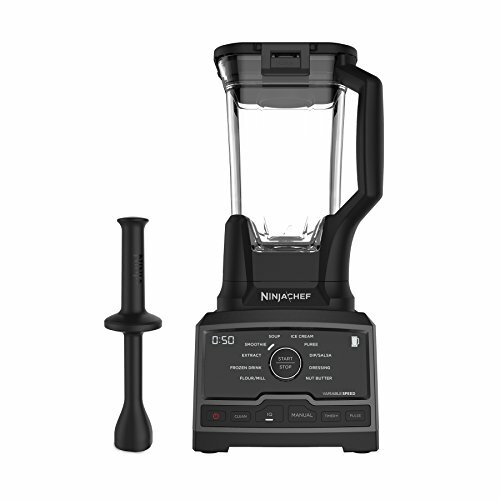 So, the Ninja Auto-IQ might not last as long, but if you can’t or won’t fork out half a grand on a blender, this is a great mid-range option and the best NInja blender. More than just a Ninja smoothie maker, this Ninja blender will make smoothies, nut milks and more. While it may not have the power of a Vitamix, it is a decent nut milk blender. WIth 1500 watts, this blender is strong, and can whip up smoothies quickly. It also has a range of variable speed controls and pre-programmed settings, such as settings for soup, ice cream and nut butters. Ninja blender review: at less than half the price of the Vitamix 7500, this is good value for money. Looking for the best blender for cashew cheese for under $200? It’s hard to find a high-speed blender at more affordable prices and the Ninja Auto-IQ strikes the balance well. If you’re budget-conscious, and want a mid-range fruit blender/veggie blender that will power through frozen fruit and veggies, nuts and more, or are looking for a Ninja vegan blender, but aren’t as concerned about how long the blender will last, then go for the Ninja Auto-IQ. Are you a Vitamix vegan or a Blendtec vegan? Vegan cooks seem to divide into two camps on the Blendtec vs Vitamix battleground. In every test, the Blendtec Designer Series performs very similarly to Vitamix. The truth? They’re both great options. However, it doesn’t do as well at smaller quantities, but if you have a large family, or tend to whip up big batches of food, the Blendtec Designer Series might be the right blender for you. The Vitamix also tends to make slightly smoother soups and smoothies. The Blendtec Designer Series does come with a smaller price tag than the Vitamix 7500; however at over $400 it’s still not a budget buy. 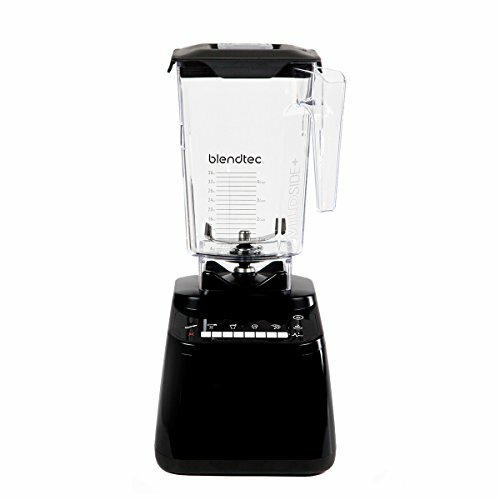 Famous for their ‘Will It Blend?’ video series featuring the Blendtec pulverising iPhones, tablets and other pieces of electronic equipment, you’d expect high performance from a Blendtec blender. Blendtec blenders do pack a lot of power. However, it doesn’t tend to puree quite as effectively as a Vitamix. If you’re looking for the best blender for green smoothies, the Vitamix might leave fewer kale chunks. Coming in at over $400, the Blendtec Designer Series is not a cheap option, but it does cost less than the Vitamix 7500. At this price point, you’re betting off saving a bit more money and going for the Vitamix 7500. However, if you want to save some money and still get a high-quality, high-powered blender, the Blendtec Designer Series is a good choice. The Vitamix 750 is the blender to get if you want a top-of-the-line blender with pre-programmed settings that allow you to set it and walk away. Personally, I never use these settings on my blender, as I prefer the precision and control of operating it myself. And when it only takes 60 seconds to blend up a smoothie or soup, I don’t consider it much of a sacrifice to wait for it to finish blending. However, if you do a lot of multitasking in the kitchen, and need the pre-programmed settings, this model is less than $100 more than the similar Vitamix model without settings. It’s certainly in the running for best food blender. The Vitamix 750 performs very similarly to the Vitamix 7500, our top pick for vegan blenders. The only real difference is the pre-programmed settings. 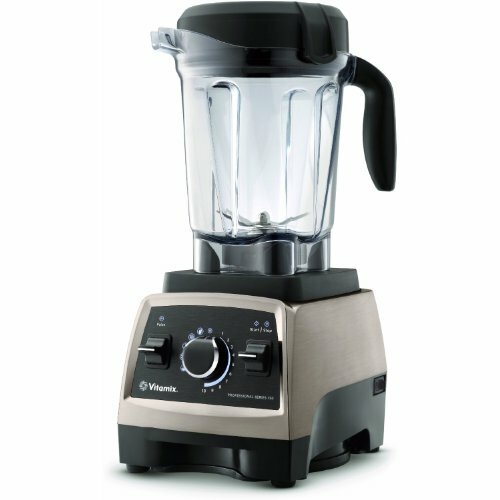 As a high-end blender, the Vitamix 750 is pricey (over $500), but if you need pre-programmed settings it won’t set you back that much more to get the Vitamix 750 over the Vitamix 7500. Certainly either is an excellent candidate for best kitchen blender. If you’re after a high-powered blender with pre-programmed settings, and the best nut blender for the creamiest plant milks, then go for the Vitamix 750. It’s pricey but good quality and will last many years. 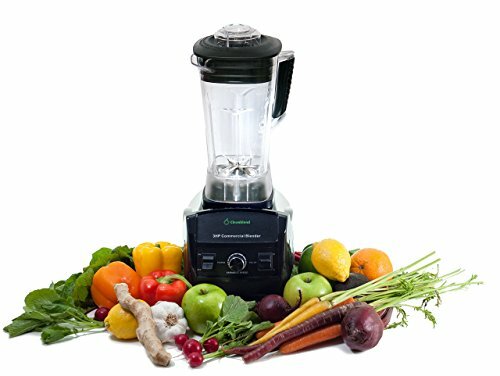 The Cleanblend is a relative newcomer in the high-speed blender market, and packs a whopping 1800 watts for under $200. However, the model is a little basic in other departments; for example, it doesn’t offer much variation in speeds and the warranty is only 5 years (compared to 7 years on a Vitamix, for example). Since the company is relatively new, it remains to be seen if it has the lasting power and durability of other high-speed blenders. Given the power of the Cleanblend, it will blitz up fruits and veggies as smooth as the Vitamix or Blendtec. However, it doesn’t offer much speed variation which can pose a problem since it gives you less control and precision. The Cleanblend is a great mid-range blender model and good value for money given its strength. The Cleanblend blender review: If you want a high-strength blender at a low(ish) price tag, and aren’t as concerned with variable speed control and a shorter warranty, the Cleanblend is an excellent option. 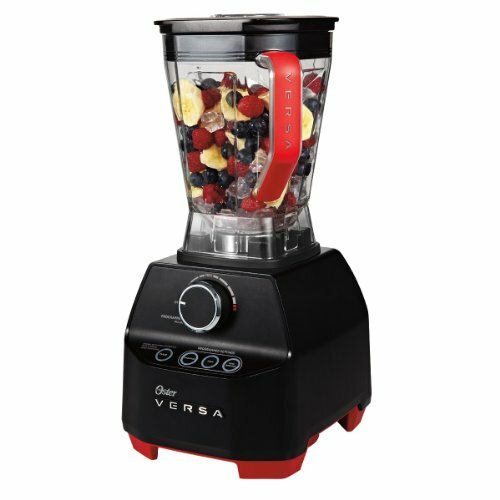 The Oster Versa is a decent mid-range blender, but if you’re looking for a lot of power at a mid-range price, you’re better off going with the Cleanblend, unless you want a lot of pre-programmed settings. The Oster Versa bests Cleanblend in this category, with 3 pre-programmed settings and a pulse function. The Oster Versa performs decently, although it isn’t as durable or long-lasting as the more expensive blenders like the Vitamix. There are many reports of the motor blowing out after a few years, although the Oster Versa does come with a 7-year warranty. The Oster Versa is good value for money, packing a pretty powerful motor at a decent price. If you’re looking for a good mid-range blender with pre-programmed settings, the Oster Versa is a good bet. However, at this price point, you’re likely better off with the Ninja Auto-IQ. The KitchenAid blender is a good budget option if you’re looking for a blender that comes in multiple colors to match your kitchen. 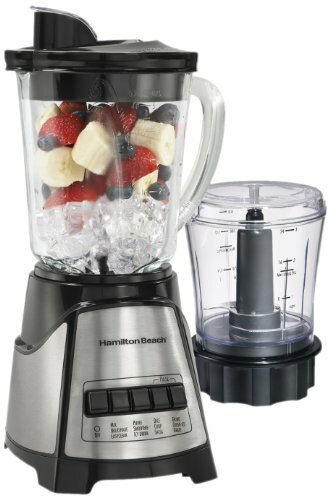 It’s fairly low-powered compared to some of the other blenders out there, at just 550 watts, but if you’re looking for a basic blender/smoothie maker to do a few tasks like make your morning smoothie (and you’re not putting anything too rock-hard in it) then this blender will be enough for you. Given the much lower watts this blender has, the KitchenAid can’t puree as finely as, say, the much more expensive Vitamix. It wouldn’t be able to handle making a nut butter. However, if you’re looking for a basic blender and you don’t cook a lot, this is a good choice, although my top choice for budget blenders (Oster 1200) is probably a better bet given its much higher number of watts. The KitchenAid blender is a good value, although at this price tag, doesn’t come with as many bells and whistles as other blenders out there. In this price range, you’re better off going with the Oster 1200. 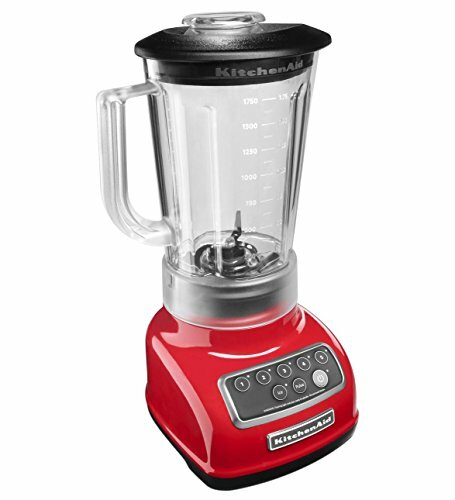 However if you don’t want a glass blender (because of the weight) or you want a blender that comes in multiple hues to match your kitchen, then consider the KitchenAid. The Nutribullet is a popular budget blender option and perhaps the best small blender if you have limited space. 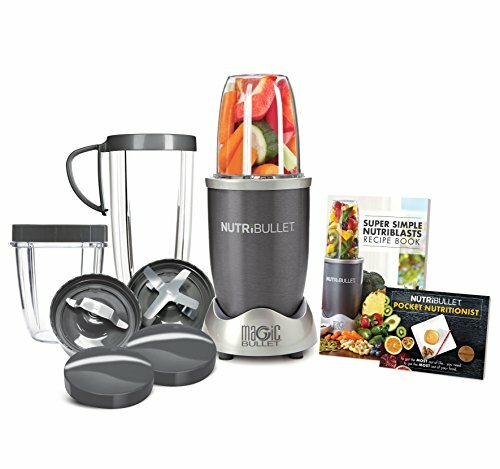 It’s widely touted as the best cheap blender for smoothies and it’s best for those who primarily plan to use their blenders to make smoothies, since its unique design is different to other blenders. Rather than a jug, it comes with two short cups and one tall cup, in which you can make a smoothie and then drink from directly. The Nutribullet is sufficient for making smoothies, but at this relatively low power, it won’t blitz through chunks of frozen fruit as efficiently as more expensive blenders. You also need to add liquid to the cup to work, meaning it’s not suitable for nut butters. However, if you’re just planning on making smoothies to-go in your blender, then this is the perfect option for you. The Nutribullet is good value, and it’s hard to ask for much more power at this price point. It’s the best blender to make smoothies if you’re on a really tight budget. The Nutribullet is great for the frequent smoothie drinker, particularly if you like your smoothie to-go in the mornings. However, if you plan to use your blender for recipes other than smoothies, like cashew cream, you’re better going with a more standard blender design. The Hamilton Beach blender is a great budget option if you’re looking for a blender with a glass, rather than plastic, jug. It would be tricky to find a glass blender at this price point. This is a great blender if you’re looking for a basic blender, but with just 700 watts it doesn’t have as much power as high-speed blenders. If you want a blender to make smoothies and milkshakes, then the Hamilton Beach is a good option on a budget. However, it does require liquid so you won’t be able to make nut butters and some other things you can do in more expensive models like the Vitamix or Blendtec. You might also have trouble with thicker cashew cheeses. Hamilton Beach blenders are excellent value, and you can’t get a blender for much less than this price point. The fact that it comes with a glass, rather than plastic, jug is impressive at this price. If you’re looking for a glass blender that does a good job at pureeing and blitzing up veggies and fruits, you’re better off with the Oster 1200. However, if you need a blender at a cheaper price point, then the Hamilton Beach is worth consideration. Just don’t expect perfectly smooth smoothies at this price. If you’re looking for the best vegan blenders in the UK (or Europe) see below. Clicking the links will take you to the local Amazon sites. I recommend the Vitamix 750 for the high end, or mid-range I highly recommend Magimix Le Blender (which is what I own). The Magimix is made in France and only available in the UK and Europe. It’s my pick for the best blender UK wide. 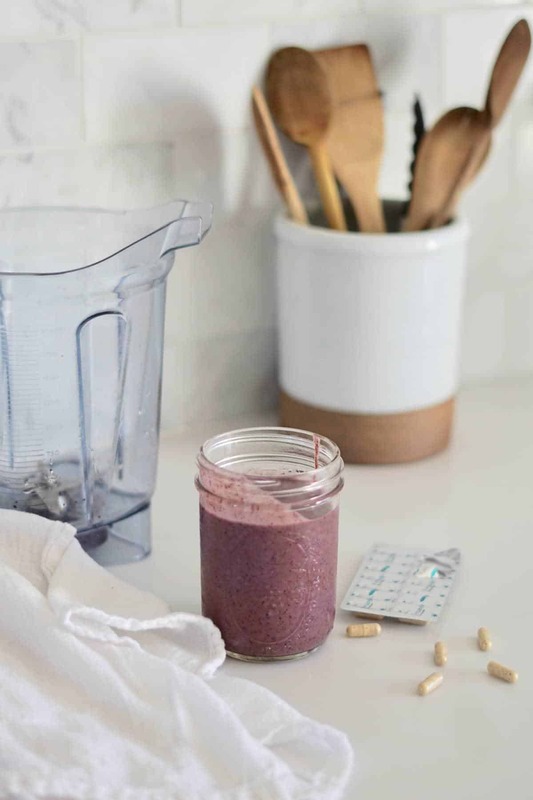 Plus, the Magimix is the best jug blender made of glass, which is much easier to clean (and means you don’t have to worry about BPA). The Vitamix 750 is the gold-standard vegan blender and the best blender for smoothies UK wise.. Anything you throw at it, the thing can do. Want nut butter? Almond milk? Cashew cream? Vegan cheese? Smoothie mixer? The best blender for ice? This thing can whip it up or crush it (in the case of ice) in seconds. It’s the best blender for smoothie bowls, too. 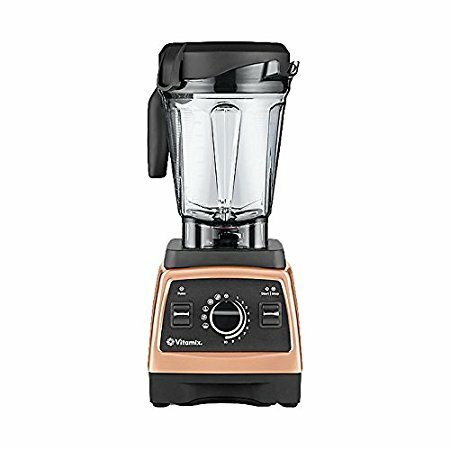 As you’d expect with the hefty price tag, the Vitamix 750 is a pro blender, that packs a lot of power and performs well at every task. Smoothies are silky smooth, vegan cream extra creamy and smoothies free of frozen fruit chunks. The Vitamix 750 is expensive, although it performs as you’d expected for the price tag. If you use a blender several times a day and plan to whip up a lot of vegan meals and you’re looking for the best high speed blender UK, then the Vitamix 750 is a great blender that will last many years. Are you after a Vitamix alternative? The Magimix blender is my number 1 choice for a vegan blender! I own a Magimix blender and it is one of the best purchases I’ve ever made. After burning out a series of cheap blenders, I worked out I could save money by buying a pricier mid-range blender, and purchased the Magimix . I’ve had it now since 2013 and it’s still going strong! If you’re wondering ‘What is the best blender for making smoothies?’ that’s also durable and made out of glass, then the Magimix is my no 1 pick! It’s very powerful, has multiple speed settings and programmes for smoothies, ice and more, and I love the glass jug. Hands-down, it’s the best glass blender available today. It’s easy to clean, doesn’t stain or smell like plastic and there are no BPA concerns. The blender is heavy but I like how durable it feels (also the weight means it doesn’t move around when blending). Looking for a soup blender? The glass is heat-resistant meaning you can blend up hot soups in it for a smoother, creamy soup! The Magimix performs very well and can blitz up just about anything. I often make gazpacho in mine and I’ll put whole tomatoes, half a cucumber and red pepper and entire garlic cloves in my Magimix. Not only does it puree everything to a smooth consistency, it does it in about 60 seconds. The Magimix is great value for money. It’s a mid-range blender and more expensive than a budget one you pick up in the supermarket, but the quality is worth it. It works much better and is much more durable than budget blenders (my £30 Argos blenders never lasted more than 6 months or a year). 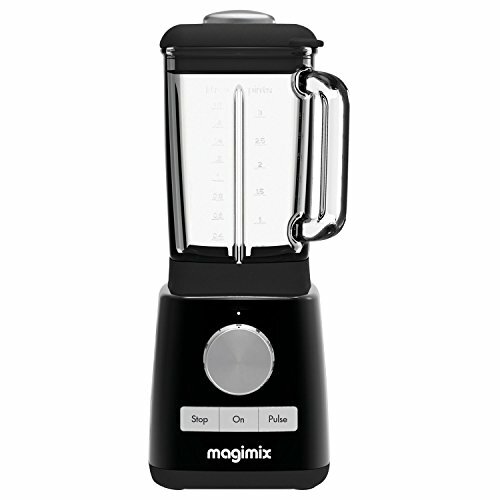 Magimix is a respected French appliance company, known for their food processors. If you’re in the UK or Europe, I highly recommend the Magimix . It’s a great mid-way point between pro blenders and inexpensive blenders, and the glass jug is a great feature (and surprisingly, the more expensive blenders don’t come with glass). It’s still got plenty of watts to blend things down quickly and smoothly and it’s very durable. You won’t regret buying a Magimix blender! 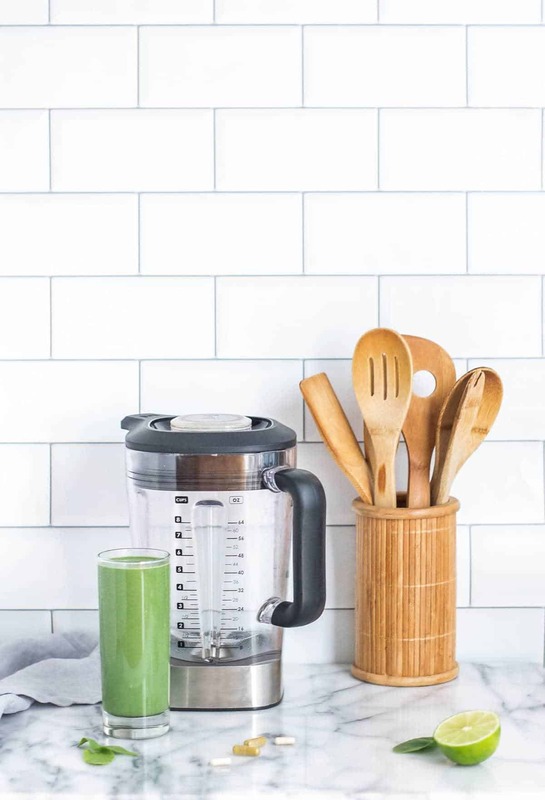 If you’re looking for vegan Vitamix recipes for your new purchase, I’ve got the best vegetarian blender recipes for you. Please note this post contains affiliate links, meaning I’ll receive a small commission, at no extra cost to you. Buying through these links helps me keep my blog running. Thanks for your support! 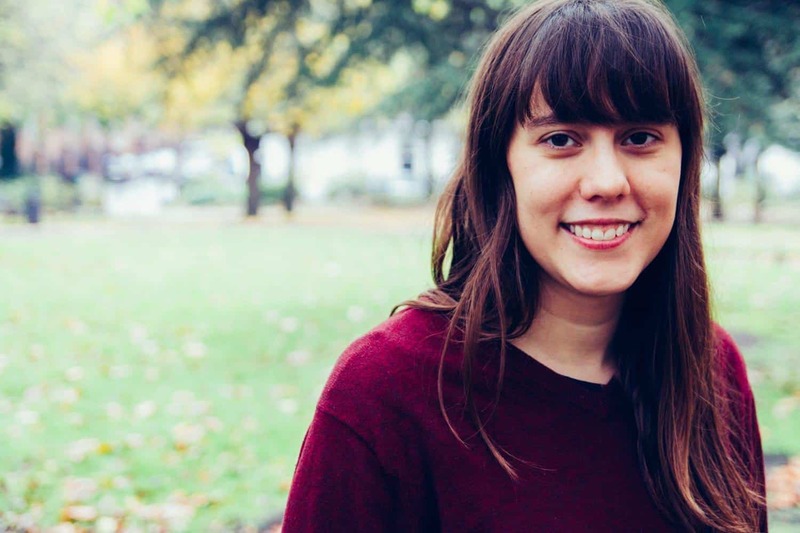 Great post and really well written!